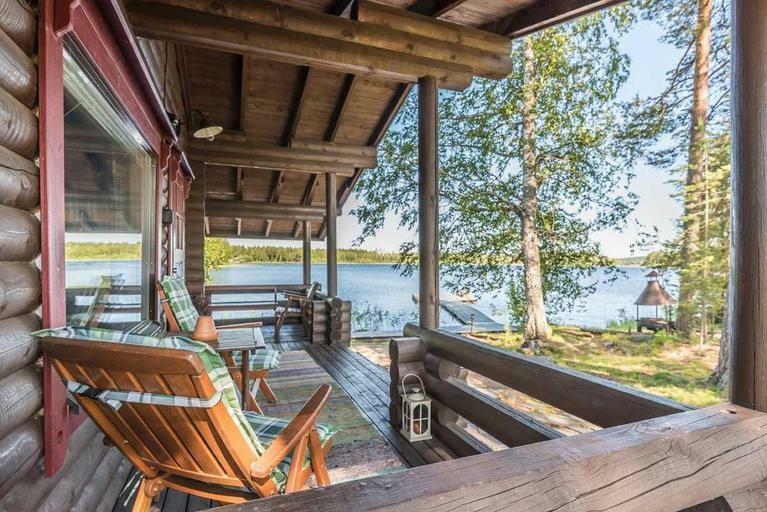 Did you know that there are more than 500,000 cottages, holiday homes and villas in Finland? Most cabins are perfectly habitable all year round, even through winter, and filled with modern comfort and conveniences. Not all cottage owners want or need to use their holiday homes at all times. 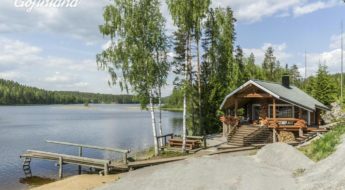 Instead of keeping the cottages empty, they’re renting them out to travellers who want to experience real Finnish lifestyle. But have YOU, as a traveller, ever considered choosing a rental cottage over a hotel room for your holiday? In case you now find yourself shaking your head and thinking ‘hell no’, this article is worth reading. As the largest rental cottage marketplace in the country, Gofinland currently has more than 7,000 cottages to choose from. This article provides you with 7 proven reasons why renting a cottage beats staying in a hotel any time of the year. 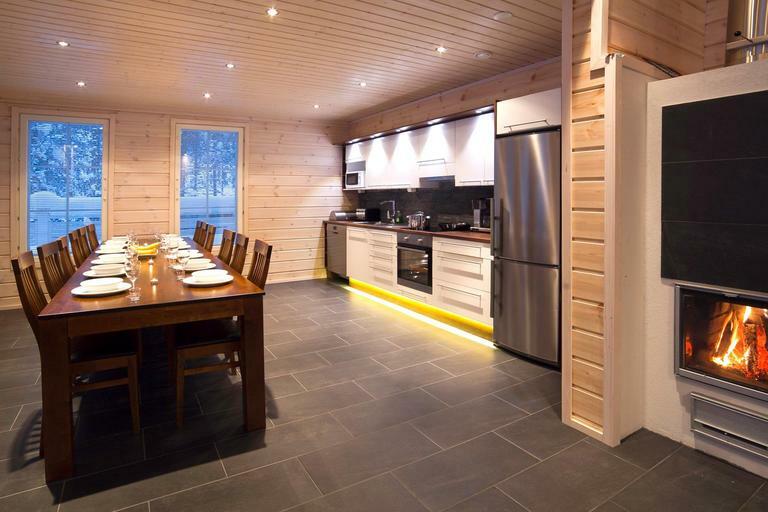 Most rental cottages have a modern and spacious kitchen like this one in Villa Silja in Levi, Lapland. Preparing meals together with friends or family is easy, fun and saves a lot of euros from your travel budget. Eating out in expensive restaurants every single night during your 2-week holiday will rapidly increase your travel budget. Rental cottages in Finland are usually equipped with modern and spacious kitchen, where cooking isn’t only a pleasure, but a fun way to spend time together with your friends and family – whoever you’re travelling with. Many cottages in Finland are located within walking distance to a local supermarket or a grocery store. That means you don’t need to do all the grocery shopping at once. You don’t either need to waste your holiday with dull household duties like doing the dishes. Just stick them in the dishwasher and let the electronics do all work for you while you’re enjoying your holiday in Finland. Almost all cabins in Finland feature a private sauna. 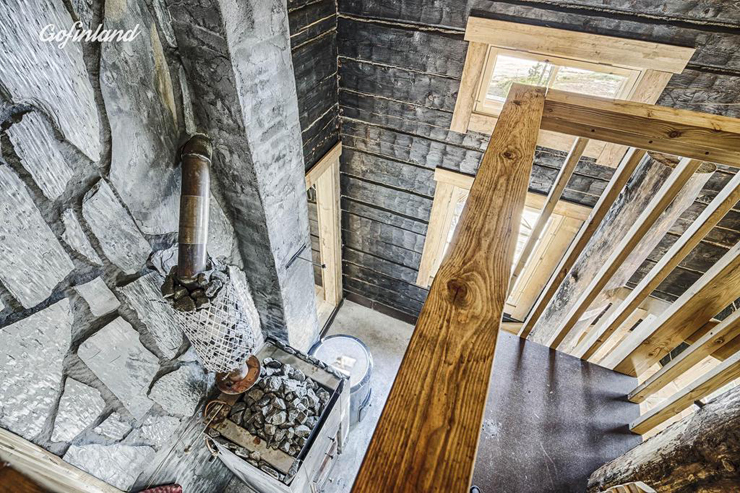 Some cottages lift the sauna experience up a notch. This two-storey sauna can be found in Hirvensalmi, Suomussalmi. Sauna is an essential part of Finnish culture, and it’s something that you need to experience at least once during your holiday in Finland. Finns are used to going to public saunas with complete strangers and, completely naked. However, we totally understand that for travellers who are visiting Finland for the very first time in their lives, the naked sauna tradition might come as a bit of a shock. Almost all hotels in Finland have a sauna for guests – for all guests. Excluding small and ascetic wilderness huts, every single cabin in Finland will have a private sauna that you don’t need to share with anyone. In your private sauna, you can get used to the Finnish sauna tradition alone and with time. Eventually, you’ll become a real sauna pro, and after a while, the idea of being naked in a public sauna with strangers will feel like an ordinary everyday thing. 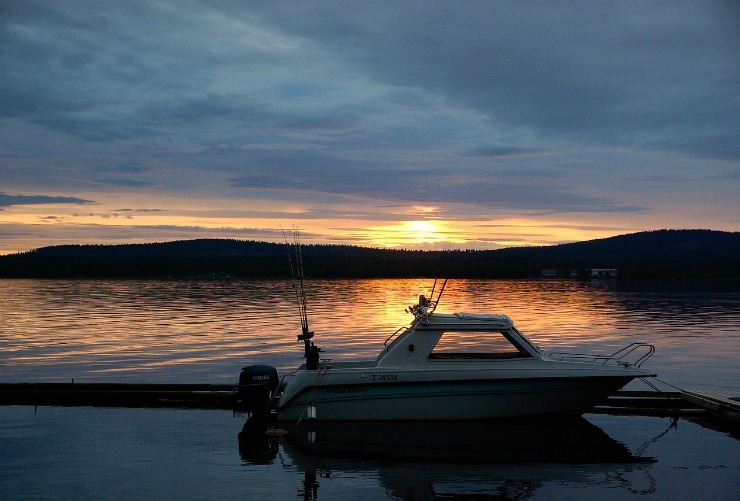 Most cabins in Finland are located by the sea or a lake and feature a private beach. Some of them feature even an outdoor jacuzzi. This lovely terrace with a lake view can be found in Ähtäri. Most cottages in Finland are located by the sea or by a lake. And why not – including all the islands, we have more than 46,000 kilometres of coastline and almost 200,000 lakes. There are plenty of shores to share. You are very likely to find a remote beach cottage where to work on your line-free tan with no one around. But remember sunscreen and a hat! Despite popular belief, it really is possible to burn yourself under the Finnish sun. Especially in springtime, when the snow reflecting the sun might even double the ultraviolet radiation. Having a private beach at your rental cottage is extremely practical also in winter. 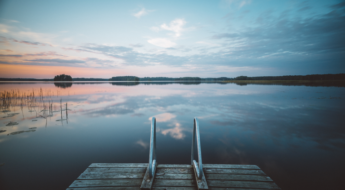 You can drill a hole in the ice for winter swimming, but if you have never done it before, make sure to ask the cottage owner for help or advice. In case the idea of dipping yourself into zero-degree water feels too scary, you can try the simpler option; Just go rolling in the snow during your sauna break and sprint back to the hot sauna. There’s hardly any hotel where all this is possible without an extra charge. But it’ll be possible in nearly every rental cottage throughout the country. Rental cabins in Finland often accommodate up to 15 people and offer many fun ways to spend time together. 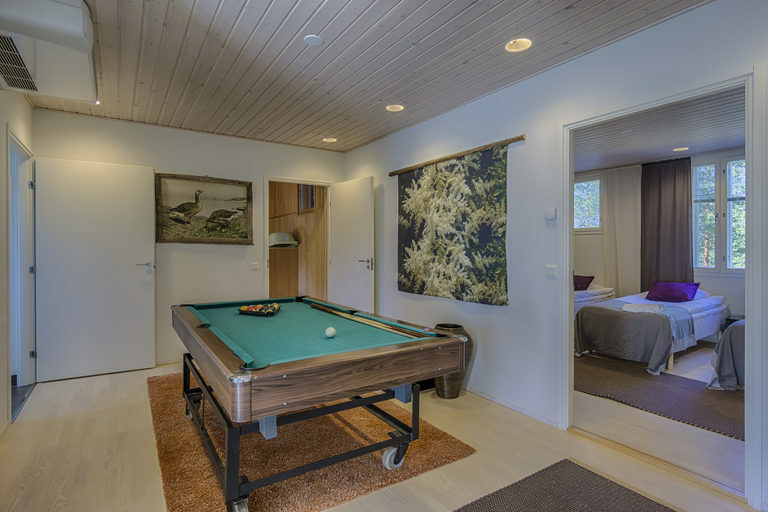 This cottage in Koli houses a pool table! Whether you’ll be travelling with family or friends, you can always find a rental cottage where you all will fit. Only in rare cases, you’ll be able to stay together in a hotel. Even if you were able to book rooms in the same premises, your rooms would most likely be located in different parts of the hotel. You will never have this problem if you choose a rental cottage for your holiday in Finland. Exactly the opposite; You will all stay together, you can prepare and enjoy all meals together around the same table and, the best of all, you can party all night long together without disturbing other guests. Some cabins feature a proper outdoor kitchen where you can cook and dine in any weather. 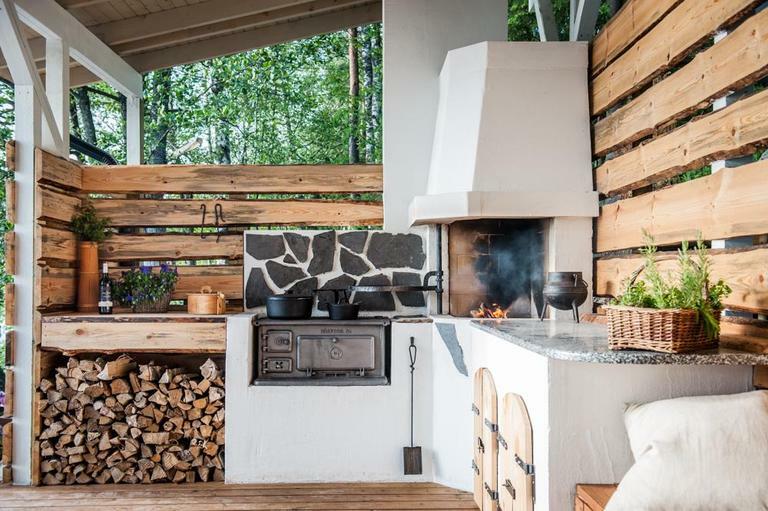 This outdoor kitchen belongs to ‘Villa Paradise’, located in Uusimaa, near Helsinki. All cottages in Finland will have a chance for a lovely barbecue. You might have a large terrace with a beautiful view of the lake or sea or a separate area in the garden for BBQ. At some cottages, you might even have a covered hut where to enjoy BBQ in any weather, rain or shine. How many hotels do you know that would have this same possibility? When staying at a cottage, you’re guaranteed to have pure Finnish nature just a few steps from your door. Yes, some hotels in Finland can promise the presence of nature, not all hotels are located in a city centre. But cottages in Finland – they never are! When renting a cottage, you’re guaranteed to have authentic Finnish nature around you, just a few steps from your front door. 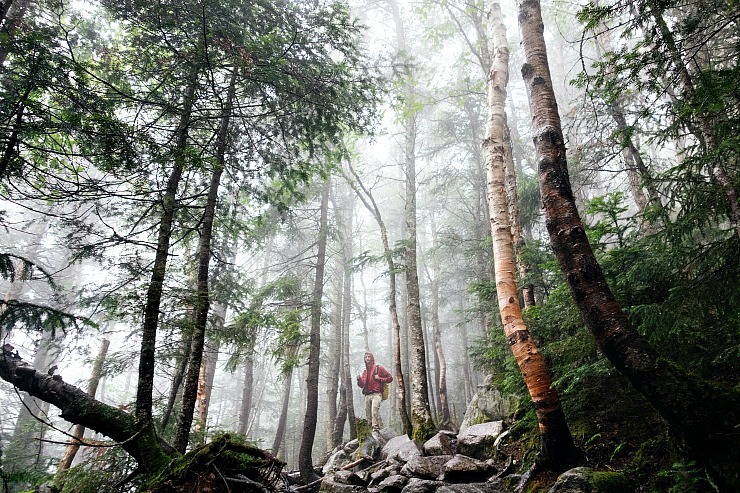 You don’t need to drive up to the nearest national park, nature reserve or hiking area. You will have all that right at your doorstep. After all, that’s what Finland is most known for. Choosing a rental cottage over a hotel for your holiday in Finland has many benefits. Sometimes also a boat is included in the rent – that’s something you won’t get with a hotel. Nowadays nearly all cottages in Finland are like proper houses or villas. Some are even more luxurious than that (see a few examples here). Staying in one will give you a clear idea how Finns live their everyday life. How they sweep the snow out of their porch, and how they carry in firewood to warm up their precious saunas and fireplaces. How they push their boats into the water and fish their own dinner. How they stay out on the terrace late at night admiring the millions of stars, the dance of the northern lights or the world-famous Midnight Sun. Would you choose a cottage over a hotel room for your next holiday in Finland? Find your ideal cottage and #FeelFinland! Saana is an adventurous travel and outdoor enthusiastic from Finland. With a huge passion for writing, she is creating content for several publications and is the sole author of bilingual travel blog Live now - dream later. When Saana isn't travelling abroad, she is showing you the best of beautiful Finland.